Your Yellowstone RV camping adventure will include seeing abundant wildlife living among the world’s greatest concentration of geysers. Yellowstone National Park has 12 developed campgrounds with over 2100 campsites. 5 reservation campgrounds have 1700 campsites, and the remaining 7 campgrounds have over 450 first come first serve campsites. Some large RV pull through campsites are available by reservation, and first come first serve. All Yellowstone campsites have a fire ring/grill and picnic table with the exception of Fishing Bridge RV Park. Water, flush toilets, and trash receptacles are provided, and RV dump stations are available at some campgrounds. Popular first come first serve campgrounds may be full by 8AM. Most campgrounds will accommodate RVs 30 feet in length or less. One of the most visited USA national parks, Yellowstone can be congested and unexpected traffic jams caused by wildlife, an unfortunate RVer, or both is likely to occur. The Old Faithful area in particular can be extremely busy so plan accordingly. During peak season you can expect delays entering the park. Yellowstone RV camping is available at 12 campgrounds, Five concession operated campgrounds with over 1700 campsites accept reservations. The remaining 7 campgrounds are first come first serve with over 450 campsites. Not all RVs will fit in all Yellowstone campgrounds so check campground information carefully. Yellowstone RV camping reservations are available at five campgrounds. All campgrounds provide a picnic table and fire ring except Fishing Bridge Campground. When making a reservation, be prepared to provide the total length of your RV and vehicles. See campground listing below for Yellowstone RV camping information. Restrooms with cold water and flush toilets. Coin-op ice and drink machines, and recycle and trash bins. RV camping sites provide a picnic table and fire grate *. Food storage regulations are strictly enforced. RV sites are either pull-thru or back in and may not be level. All RV sites at Fishing Bridge are back-in sites. Possible limited width. * Bridge Bay Campground has no picnic tables or fire rings, and doesn’t sell firewood. Senior Pass and Interagency Access Pass discounts not available. Group campsites are for tent camping only. Refer to the above map for campground location within the park. Bridge Bay Campground – 432 campsites at Yellowstone Lake with outstanding views of the Absaroka Montain Range. Popular Yellowstone RV camping location for boating and fishing with open or shaded campsites available at 7800 ft. Limited number of large RV campsites available. RV dump station near campground entrance. Canyon Villiage Campground – It’s central location in the park makes this 270 site campground one of the most popular in Yellowstone. Close to the Grand Canyon of the Yellowstone in lodgepole pines at 7900 ft. The nearby Canyon Visitor Center has great information about Yellowstone’s wildlife, geology, and supervolcano. Fishing Bridge RV Park – This “Bear Country” Yellowstone RV camping location allows hard side RVs only. 340 open back-in campsites at 7800 ft. will handle RVs up to 40 feet in length. RV dump station near campground entrance. No more fishing allowed from the birdge, but great wildlife and bird watching. Grant Village Campground – Near West Thumb Geyser Basin, this 430 site campground sits at 7800 ft in the forest at Yellowstone Lake. Back-in and pull thru Yellowstone RV camping sites with a few accommodating rigs up to 40′. RV dump station near campground entrance. Madison Campground – Located near the Madison River, you’ll find great views with outstanding fishing opportunities at one of the parks most popular campgrounds. This Yellowstone RV camping location is convenient to the Old Faithful area, and the 278 site campground sits at 6800 ft. RV dump station available at campground. Over 450 first come first serve Yellowstone RV camping sites are available at seven campgrounds. You will need to arrive early in the day to find a campsite at these campgrounds during peak season. Arriving after 8AM may be too late for some campgrounds. All campsites have a picnic table and fire ring, and campgrounds have water, flush toilets, trash receptacles, and usually a campground host. Refer to the above map for Yellowstone RV camping locations within the park. Indian Creek Campground – One of Yellowstone’s more primitive campgrounds, this first come first come campground fills rapidly. 70 generator free Yellowstone RV camping sites at 7300 ft near Sheepeater Cliffs. 10 sites will accommodate rigs to 35 ft, another 35 campsites will handle rigs to 30 ft. Great hiking and wildlife viewing in the area. Lewis Lake Campground – RVs and vehicle/trailer combinations longer than 25′ are prohibited at this 85 site generator free campground. Usually the last campground with sites available in the park, boating, fishing and wildlife viewing are available activities. Located in logdgpole pines at 7800 ft. Perhaps the best moose viewing area of the park. Mammoth Hot Springs Campground – 85 mostly pull-thru Yellowstone RV camping sites can handle rigs to 75 ft long. With an elevation of 6200 ft, it’s the only Yellowstone campground open all year. Generator use allowed 8am to 8pm. Located near Mammoth Hot Springs Terraces, you’ll find great wildlife and hiking opportunities. Fills quickly in summer, but quiet during off season. Norris Campground – Norris Geyser Basin and the Gibbon River are close to this 100 site campground. This popular Yellowstone RV camping location is situated in lodgepole pines at 7500 ft. elevation, the Museum of the National Park Ranger, and the Norris Geyser Basin Museum are nearby. Large meadow near campground affords great wildlife viewing opportunities. Generator use allowed 8am to 8pm..
Pebble Creek Campground – This first come first serve campground fills up fast and offers a few long pull-thru RV campsites. You’ll find fabulous views of the Absaroka Mountains and a more primitive camping experience at the 27 generator free campsites. 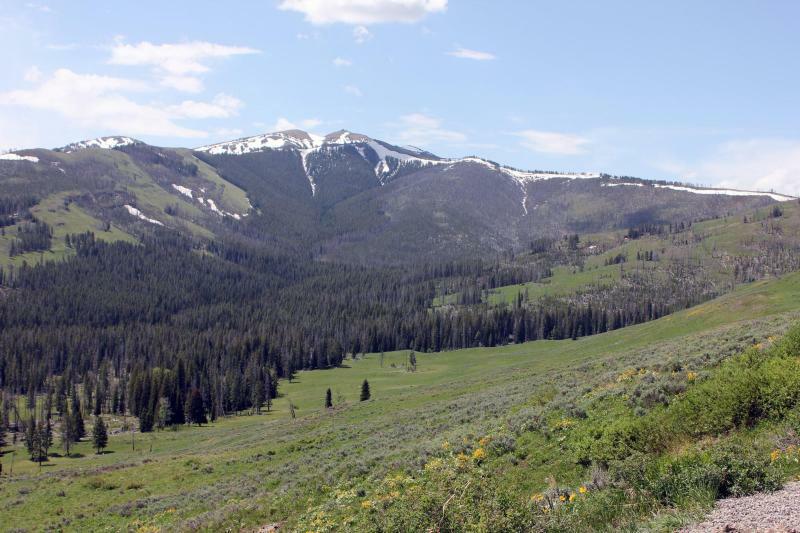 Located at 6900 ft, there is fishing, hiking, and great wildlife viewing nearby. Our favorite Yellowstone RV camping location. Slough Creek Campground – Down a 2 mile gravel road, this popular campground is usually full by 8AM. The smallest Yellowstone campground has 23 generator free campsites at 6200 ft. offering some of Yellowstone’s best wildlife viewing opportunities. Fishing in Slough Creek is close to the campground. 14 of these Yellowstone RV camping sites can handle RVs to 30′ in length. Tower Fall Campground – This generator free 31 campsite campground is on steep and winding Dunraven Pass road. The campground can handle RVs to 30 ft in length and is generator free. Across road from 130′ Tower Falls, this is a popular hiking area with great views. Many people prefer a quieter Yellowstone RV camping experience than is available within the park, and there are many RV camping possibilities available outside Yellowstone. US Forest Service campgrounds near Yellowstone are primarily primitive, but a few have RV electric campsites. Most have a fire ring, picnic table, and vault toilets. Some have water, flush toilets, and trash receptacles, and some are little more than an open field designated for camping. Fees range from free to $25 per night. Colter Campground – Only hard sided RVs are allowed at this first come first serve 18 site campground 7 miles from Yellowstone National Park. Soda Butte Campground – Hard sided RVs only and no reservations accepted at this 27 site campground 6 miles from the park. Chief Joseph Campground – Just 6 first come first serve campgsites available 9 miles from Yellowstone. Eagle Creek Campground – 16 first come first serve campsites just 2 miles from Yellowstone National Park. Timber Camp Campground – Free RV camping is available at this designated dispersed camping area 9 miles from the park. First come first serve with room for any size RV. Bear Creek Campground – Free RV camping 9.5 miles from Yellowstone National Park. This campground will handle RVs to 28′ long. Grand Teton National Park Campgrounds are ideal for RV camping. Six campgrounds in one of the USA’s most scenic national parks. Flagg Ranch – We don’t usually include private RV campgrounds, but Flagg Ranch is the only campground of any type between Yellowstone and Grand Teton national parks. Full hookups with pull through RV campsites available. Limited Dispersed RV camping (boondocking) is available along the 36 mile gravel Grassy Lake Road. This area is not suited for large RVs and gives access to south Yellowstone hiking trails with sites suitable for smaller RVs. Read about the road conditions and RV camping opportunities carefully. Check local conditions before departure. The Shoshone National Forest Cody Ranger District has several developed campground on the east side of Yellowstone National Park. Three Mile Campground – Three pull-thru RV sites and back in space will accomodate RV combinations to 60′. Hard sided RVs only at this campground 3 miles from Yellowstone National Park. Big Game Campground – 16 campsites on the North Fork of the Shoshone River. Reservations accepted at this campground located 25 miles from Yellowstone. Clearwater Campground – Reservations accepted at this 11 site campground. Very small RVs only located 21 miles from Yellowstone National Park. Eagle Creek Campground – Hard sided RVs only at this 20 site campground just 8 miles from the park. Elk Fork Campground – 13 RV camping sites at the primitive campground 25 miles from Yellowstone National Park. Newton Creek Campground – 31 campsites 16 miles from Yellowstone allow only hard sided RVs. Rex Hale Campground – Reservations accepted at this 30 site campground 18 miles from Yellowstone. Wapiti Campground – Reservations accepted at this 41 space campground. Some sites have electricity located 25 miles from Yellowstone. Baker’s Hole Campground – 73 campsites, 33 with electricity are available in this first come first serve campground 3 miles from Yellowstone. Rainbow Point Campground – Reservations and electricity is available at this 26 site campground 10 miles from the park. Lonesomehurst Campground – Reservations available and 5 of the 27 campsites have electricity. 12 miles from Yellowstone National Park. Cherry Creek Campground – There are only 7 first come first come campsites at the campground by Hebgen Lake. 14 miles to Yellowstone. Spring Creek Campground – 6 first come first serve campsites 18 miles from Yellowstone. Cabin Creek Campground – Reservations available at this 15 site campground 22 miles away from the park. Beaver Creek Campground – Reservations available at this 64 site campground 24 miles from Yellowstone. Red Cliff Campground – 27 of the 65 campsites have electricity at this campground 35 miles from Yellowstone National Park. Reservations available. The Caribou-Targhee National Forest offers many developed RV camping locations. Zoom in on the Interactive Recreaton Map for location and listings of US Forest Service campgrounds. For the adventurous, dispersed RV camping (boondocking) is permitted throughout the forest. By using the official US Forest MVUM’s (motor vehicle Use Maps), great RV campsites can be found. Caribou-Targhee Motor Vehicle Use Maps. These are the only official US Forest Service open route maps. The park is host to nearly 4 million visitors each year, so Yellowstone RV camping reservations will likely make your trip a bit easier to plan. However, we think the first come first serve campgrounds should not be overlooked. Some of these campgrounds offer the most spectacular of Yellowstone RV camping locations available, but the only way to get one of these fantastic campsites is with a bit of luck, and arriving early in the day.